When my mother came to visit us from China, she brought all the recipes with her. 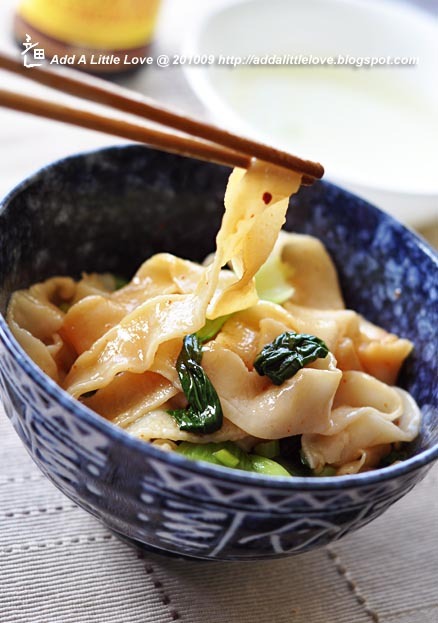 The stretching noodle is one of her signature dishes. My parents have been eating this for all their lifes, and they never get tired of it. The noodle makes my father happy no matter what. He can have this noodle every single day. All-purpose flour, water, green onions, dry chili pepper flake, bok choy，soy sauce and vinegar. All-purpose flour and water to make a soft dough. Use a rolling pin to flat the dough till 1/8 inch thick. Rest the dough again for 30 minutes. In the mean time, bring a big pot of water to boil. Cut the dough into half inch stripes, and stretch the stripes as thin as you can, then drop it into the boiling water. Boil the noodles for about 3-5 minutes. Add some bok choy the very last moment. 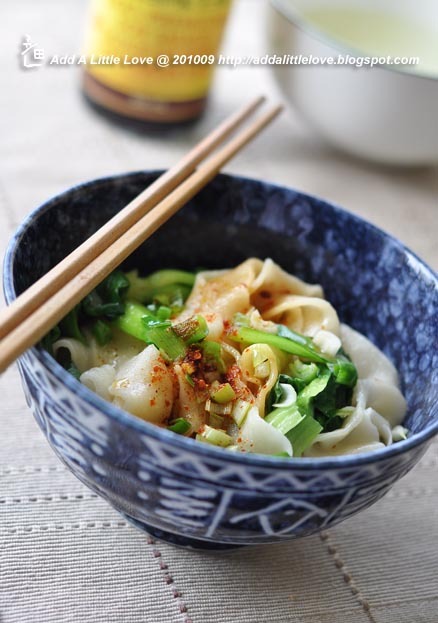 Put the boiled noodle and bok choy into a bowl. Drop some chopped green onions, dry chili pepper flakes and salt. Pour the very hot oil onto the green onions to bring out the flavor. Season with soy sauce and vinegar. My mother loves working with flour. I guess she enjoys feeling the dough between her hands. The texture, softness, and flexibility. Once the dough is ready, it can be turned into anything by my mother's hands. All-purpose flour, yeast, water, oil and salt. All-purpose flour, water and yeast make a medium soft dough. Rest for an hour. Use a rolling pin to flat the dough as thin as you can. Drizzle the oil and evenly distribute the salt on the surface. 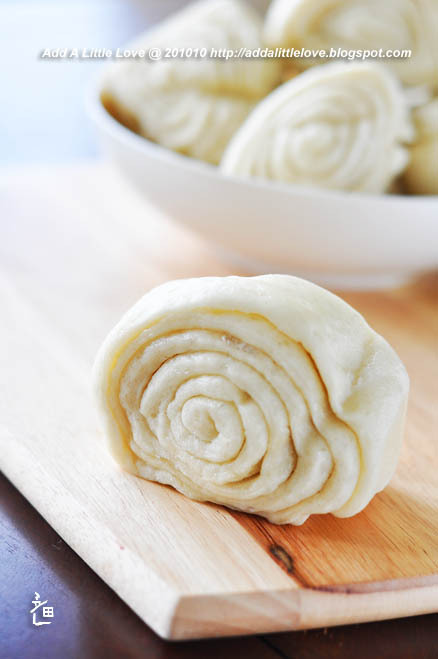 Roll up the dough and cut into one and half inches buns. Rest the buns for another half hour. The dish looks lovely. Thanks for sharing. Hehe, I hope to recreate this dish for a festive / original Thanksgiving! This noodle was made by my mother, and she never used measuring cups in her life. When she is making the dough, she constantly adds the flour or water to make the right consistency. The consistency of the noodle dough is very much like the pizza dough without the yeast. Mother told me the key is to knead the dough well and let it rest long enough so it can be stretched very thin. As soon as I saw your picture of stretched noodles on Tastespotting yesterday I knew I had to give this dish a try. In fact I made your stretched noodles for dinner last night and they were a big hit. Delicious and so simple to make. I'll be blogging about them on this weeks Weekend Blog Showcase. Thank you for a wonderful recipe and exceptional photos. Hello, your noodles look really yum and I was wondering what oil you were talking about in the last step? I am using canola oil. You can use any vegetable oil or peanut oil. I would not recommend olive oil, since its smoke point is low. Thanks for your wonderful comment and sorry for the late reply. I was hoping that I could measure the ingredients for you when my mother makes that again. However after so many days still did not get the chance to do it, since I have to take care of two small kids. The younger one is only two months old. If you could send me your email address, I can send you the measurements later whenever my mother is making the buns again. Thanks for telling me that the noodle post has inspired you. It does mean a lot to me. A comment like this makes me very happy. By the way another noodle post is coming soon. Hope you like that as well. I love this dish. Thank you for sharing.